Sometimes, as parents, we get into a monotonous and very robotic way of interacting with our kids. You want them to feel loved and connected, but are out of creative things to talk about. You ask the same, old questions and they give you the same, old answers. Trust me, it happens to the best of us! That’s why I came up with this list of 100 conversation starters for kids. I know that those same ol’ conversations get a little bit stagnant and as parents, we often need some interesting topics to get our kids thinking and talking. Instead of feeling like we are on the movie “Groundhog Day”, we need to drive new and exciting conversations that will have a positive impact on our relationships with our kids. Whether you’re at the dinner table, or just hanging out with your children, you can choose some questions to ask and get the conversation going. This simple act of communication will benefit your relationship with your kids and will make memories that will last forever. 1 | Print the conversation starters and put them in a jar and choose one (or as many as you want!) at dinner time. 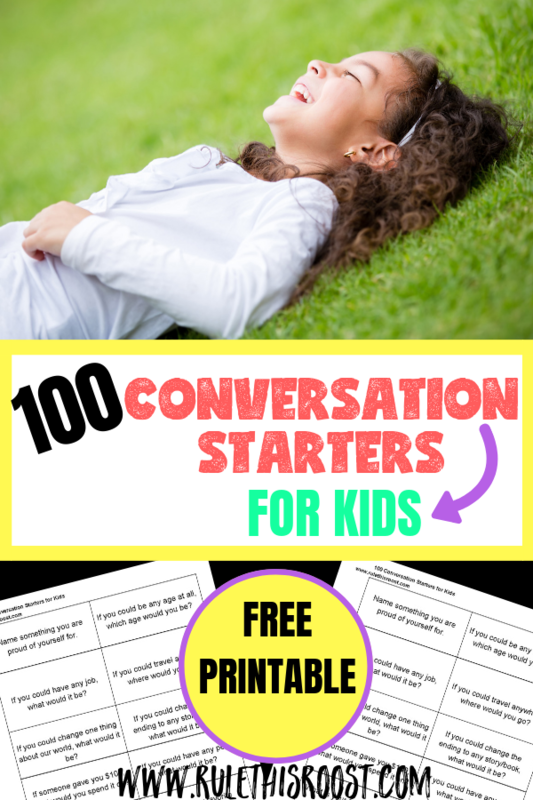 Grab your free printable and cut out the conversation starters. Have your kids decorate a jar to store them in. Fold up the conversation starters and put them in the jar. 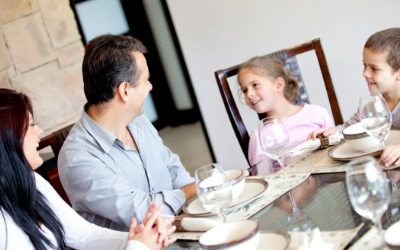 You (or your kids) can choose a conversation starter to discuss at the table. As you choose each one, make sure to set them aside so you don’t have repeats day after day. 2 | Print out the list of conversation starters and check them off each day. If you would rather go down the list of conversation starters, you can print out your free download and then check off each one as you ask them to your kids. No cutting, and no jar to keep track off, but still good conversation that you can have with your kids. 3 | Download the conversation starters onto your phone. This is a great way to have your conversation starters on the go. Maybe you want to have something to talk about in the car when you’re running errands, or maybe you’re going on a long road trip and could use something to chat about. Either way, having the conversation starters on your phone is another great way to initiate meaningful conversations with your kids. Make sure to scroll down to grab your printable conversation starters! What is one thing you enjoyed about today? What is one thing you would change about today? What is something fun you did today? What is something you did not like about today? What is something that made you think really hard today? What was a mistake you made today? Name one thing you want to accomplish by the end of the day/week/month/year. If you could eat lunch with any famous person, who would you eat lunch with? What is something about today that you found interesting? Name something you are proud of yourself for. If you could be any age at all, which age would you be? If you could change one thing about our world, what would it be? If you could change the ending to any story/book, what would it be? If someone gave you $100, what would you spend it on? What is your very most favorite food? How much t.v./screen time do you think kids should have each day? If you could change one thing about your room, what would it be? If you could change one law, which one would you change? If you had paint and a blank canvas, what would you paint? Would you rather eat your least favorite vegetable or give someone all of your money from your piggy bank? What is something you consider yourself really good at? What is your most favorite thing to do outside? What is your favorite t.v. show and why? What is something that embarasses you a lot? If you could have one super power, what would you want it to be? If you could only shop in one store for the rest of your life, which store would it be? Would you rather travel by boat, plane or car? If you could only keep 3 books, which ones would you keep? What is one way that you can tell someone loves you? What is one way that you can show someone you love them? What is something that you look for in a friend? What is something that really confuses you? If you had to give yourself a new name, what would you name yourself? If you could drive any car in the world, what would it be? If you had a million dollars to spend on anything, what you spend it on? If you could make your own movie, what would it be called? Name 5 things you would take to a deserted island. What do you remember most about the past year? If you could add one thing to your backyard, what would it be? If your friends/family could only use one word to describe you, what do you think that word be? If you could volunteer anywhere, where would it be? If you had to choose another country to live in, where would you live? If you could buy a ticket to travel to the moon, would you go? Why or why not? Would you rather go to a snowy mountain town or a tropical beach? Would you rather skip, march or hop everywhere you went? Name one thing that makes you feel sad. If you could have only one of your senses, which one would you choose? What is your favorite way to help others? What is a random act of kindness you would like to do? If you could go into any TV show, which one would it be? If you could train any zoo animal, which one would you choose? Would you rather go to the doctor or the dentist? If you could… would you rather travel to the very bottom of the ocean, or to the sun? Would you rather camp in a tent, or in a cabin… why? What is something that makes you feel anxious? Imagine if dinosaurs came back to life. What would you do? If you could travel into the future, what would you want to see? What is a fear you have gotten over? How did you get over it? If you could make a rule for the day and everyone had to follow it, what would it be? If you were the President of the country for a day, what is the first thing you would do? Would you rather have the power to shrink something, or make it bigger? If you could learn any language, what one would it be? If you could swim in a pool of any food, what food would it be? Final thoughts on conversation starters for kids. Any meaningful conversation you have with your kids is going to have an impact. Our kids need to feel heard and connected to us and this is the perfect way to do both. Whether you are on the go, or you are sitting down at the dinner table together, these conversation starters will get your kids talking and strengthen your relationship.